If you have some time to kill and want to add some names to your entertainment watchlist, here are 9 new movie, TV and game trailers to get you started. It’s Friday and it’s time to obsess on something other than the new iPhones. While some of you may be off playing Shadow of the Tomb Raider this weekend, many of you would be catching The Nun and The Predator on the big screen. But, there’s a trove of fresh entertainment headed your way this year and the next, and we’ve got the trailers to prove it. So if you have some time to kill and want to add some names to your future watchlist, here are 9 movie, TV and game trailers to get you started. Remember Sabrina, the Teenage Witch? My guess is if you were born in the 90s you definitely read or atleast came across the comic books marketed by Archie comic. The character also appeared in TV show by the same name, wherein Sabrina is seen living with her 500 year old aunts and a talking cat. Netflix’s adaptation of Sabrina (Kiernan Shipka) is a darker reimagination of the character and comes from the makers of Riverdale. The show description reads - “She’s been waiting her whole life for her 16th birthday, but something wicked this way comes, forcing her to choose between the path of light and the path of night. The series arrives on October 26. Check out the trailer below. 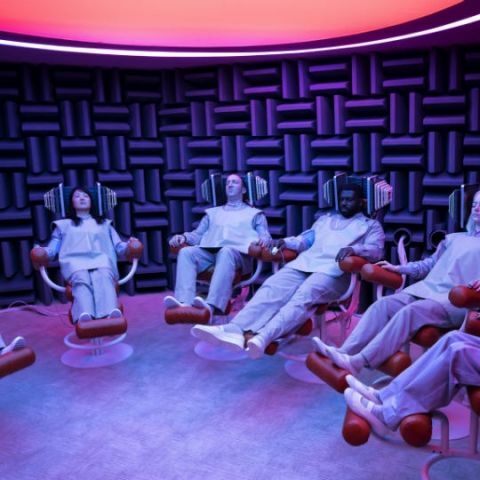 A Netflix limited series starring Emma Stone and Jonah Hill, Maniac tells the story of two strangers drawn to the late stages of a mysterious pharmaceutical trial. Annie (Emma Stone) is disaffected and aimless, fixated on broken relationships with her mother and her sister; Owen (Jonah Hill), the fifth son of wealthy New York industrialists, has struggled his whole life with a disputed diagnosis of schizophrenia. Their soul connection could save their lives. He’s back! After the mysterious ending of The Defenders, the Devil of Hell's kitchen is back for a third round. The new teaser is short and sweet and shows Matt Murdock sitting in a confessional, admitting he would rather be the devil than himself. The show releases sometime in October, if rumours are to be believed and will also pay homage to the original corridor fight scene from season 1. This John Goodman film is set in a Chicago neighborhood nearly a decade after an occupation by an extra-terrestrial force. The movie explores the lives on both sides of the conflict - the collaborators and dissidents. Starring James Franco, Liam Neeson and David Krumholtz and Directed by the Coen brothers, The Ballad of Buster Scruggs is a western anthology that follows six different storylines all centered around one man named Buster Scruggs. The movie was reportedly created for Netflix as a six part series originally, but a decision later turned it into a film. The movie releases on Netflix this November 18. Starring Emma Stone, Rachel Weisz and Nicholas Hoult, The Favourite looks like a dark comedy set in the England of early 18th century. I would watch this one just for the star cast. The Favourite releases on November 23, 2018. Dawn the role of the legendary Lara Croft in the concluding chapter of her origin trilogy. The game is available now on the PS4, Xbox One and PC. This time around the focus is more on raiding tombs than taking down foes. From being an action adventure game the Assassin’s Creed franchise has transformed into a full blown RPG game. With odyssey, you have the choice to choose a male or female protagonist and control the outcome of your decisions. If you want the control of a courtroom thriller in the palm of your hands, then you need to check out Project Judge. The game brings with it some intense action, spying and some decision making.